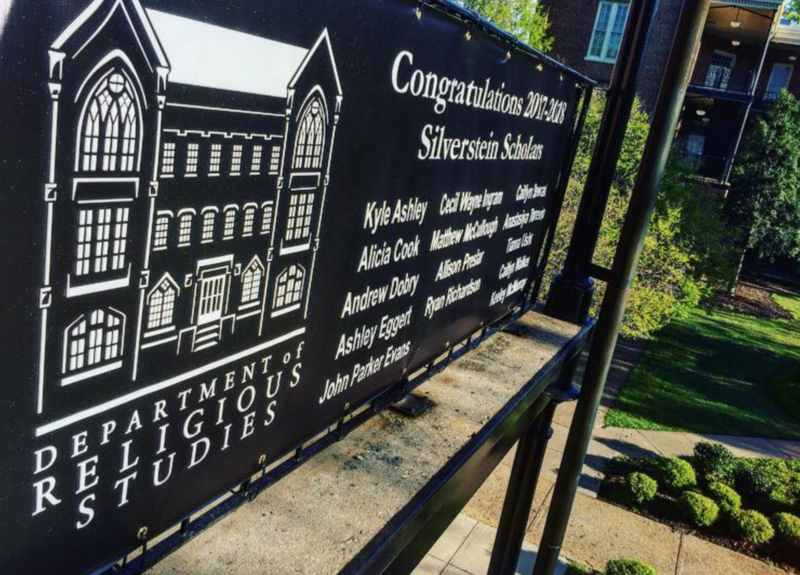 Yes, it’s that time of year again: the Spring semester is starting to wind down and that means it was once again time for balcony banners and Honors Day — the occasion when we recognize some milestones and noteworthy accomplishments from the past year. 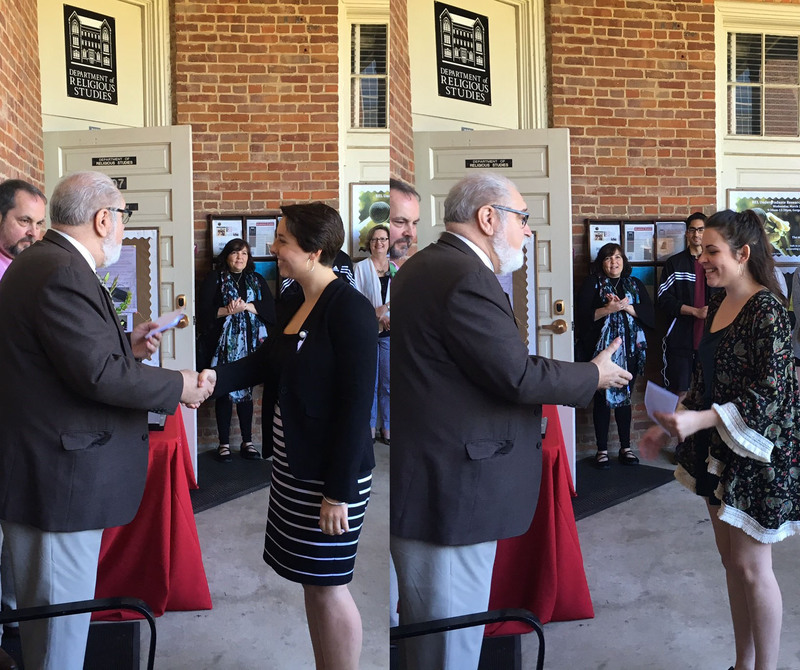 That’s Prof. Jacobs (left) and Prof. McCutcheon (the Chair of the Department), officiating at our 2017 Honors Day Ceremony. 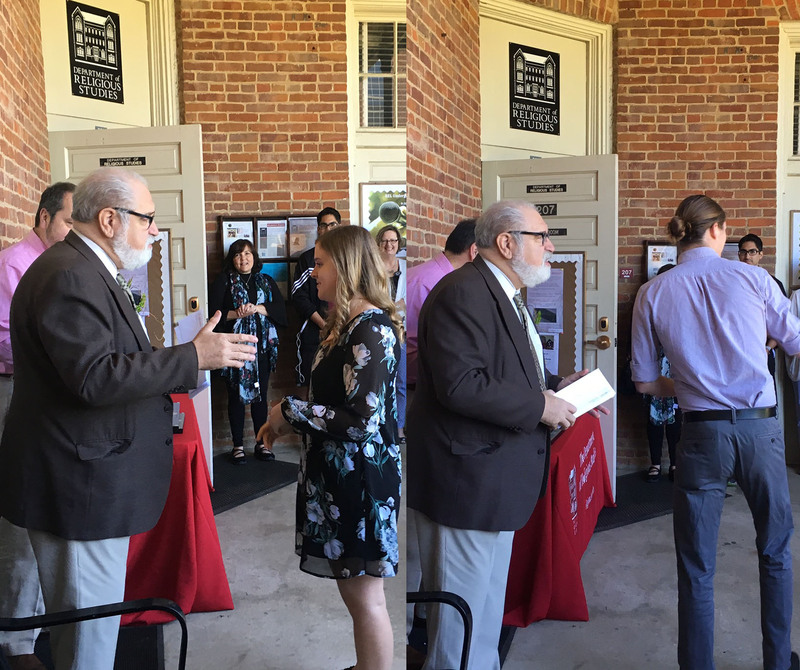 While some students were recognized earlier that morning at the Arts & Sciences Honors Day Convocation, the Department once again had its own luncheon at noon, to honor all of its award recipients. 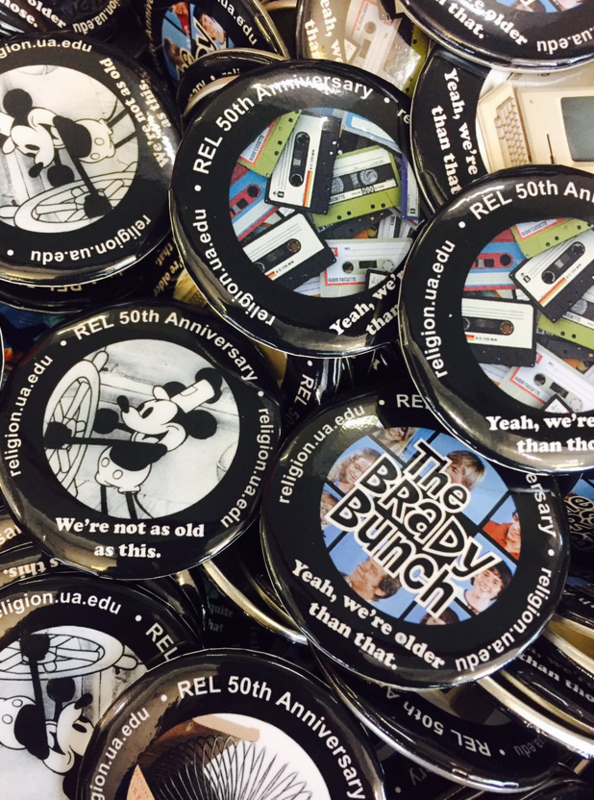 It’s our 50th anniversary too, by the way, making this a special Honors Day to be part of — and so we of course had a basket full of anniversary buttons for the taking. 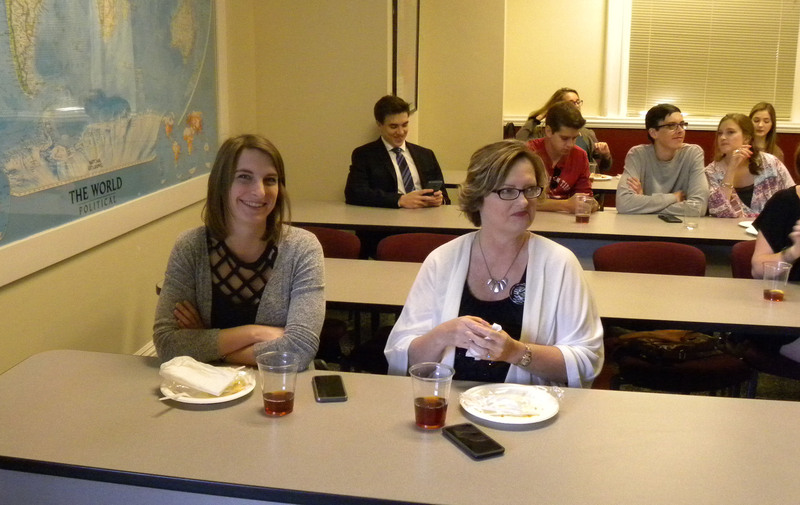 To kick off the event, we started with some delicious food and showed a couple of video compilations of life in the Department and in the RSSA, made by Caity Walker (pictured below, at left, with her mother) and Ellie Cochran (not pictured here, but we’ll see her somewhere below). What? Not seen our videos…? 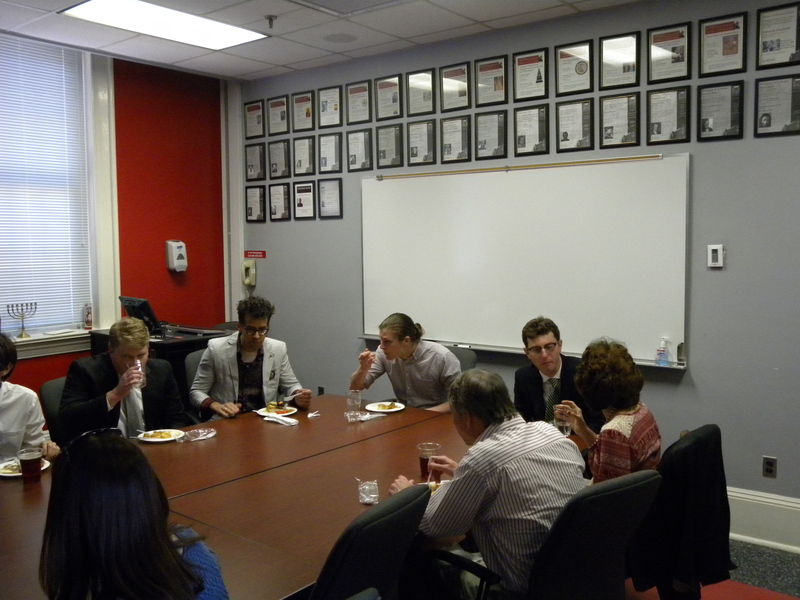 Just a few doors down, in our seminar room (lined with flyers from past Religion in Culture lectures) faculty, students, and members of their families who made the trip to Tuscaloosa, all enjoy their lunch as well as some lively conversation before the awards ceremony began. 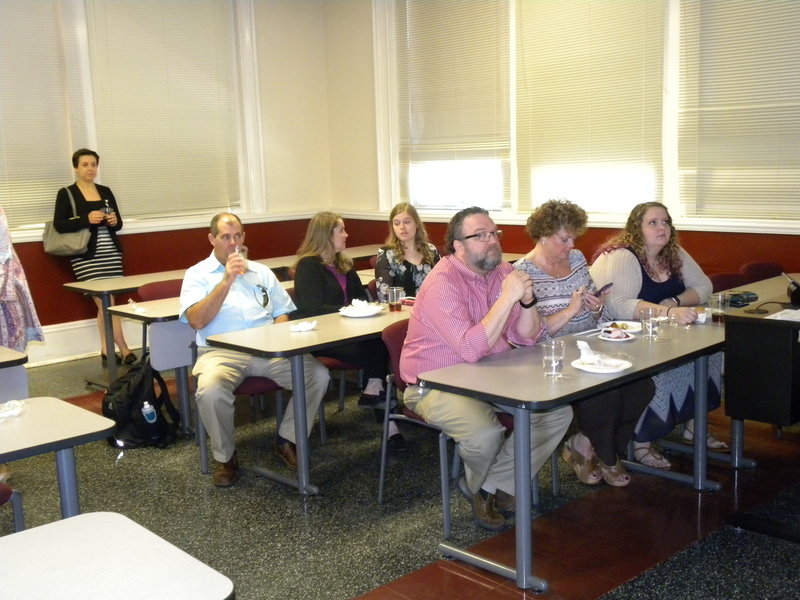 Catie Stewart (far right, second row, below) and Alicia Cook (far right, first row), both Silverstein Award recipients, are finishing up their lunches and enjoying time with their families while watching some of the REL movies. And yes, that’s Anastasiya Titarenko at the back — our resident world traveler and incoming president of our student association. Jared Powell, below, who stopped by to spend some quality time on the balcony, away from the English Dept. 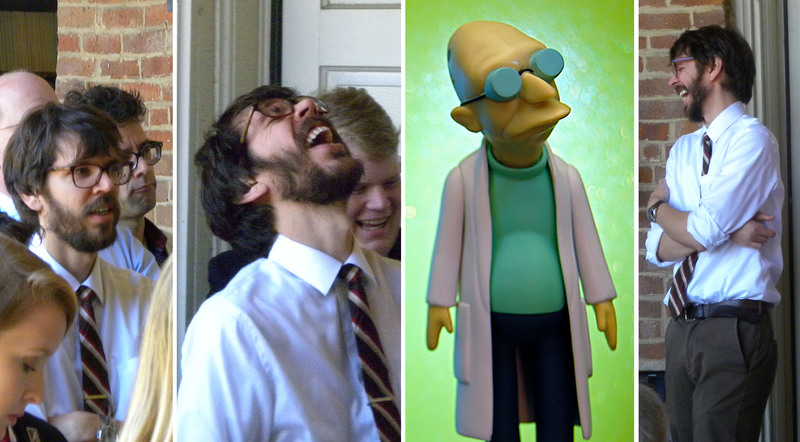 where he’s now midway through an M.A., catches up with Prof. Ramey. 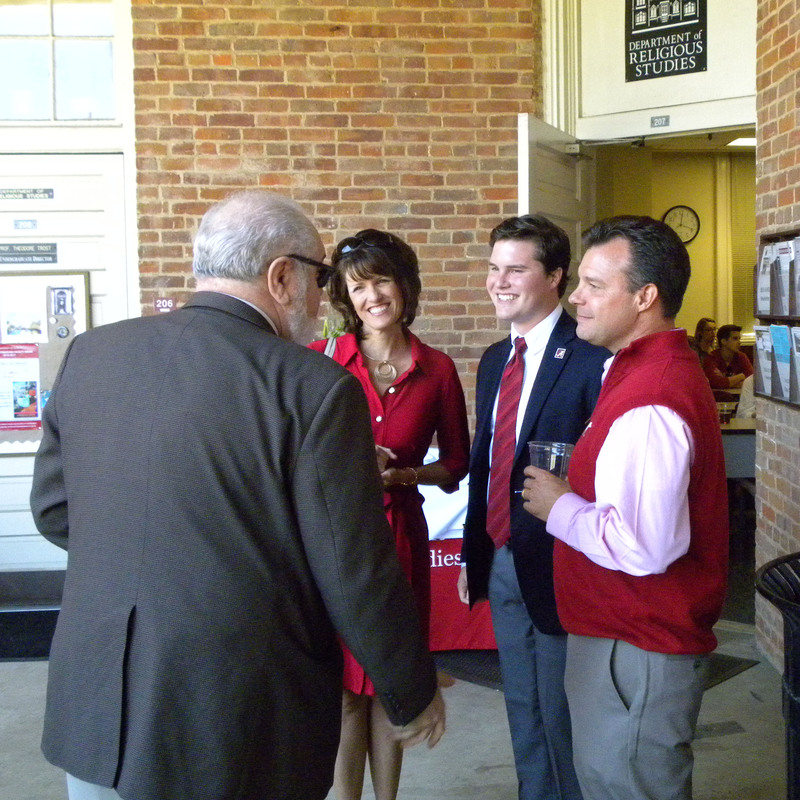 Andrew Dobry (below), another Silverstein Scholar, and his parents chat with Prof. Jacobs before the awards begin. 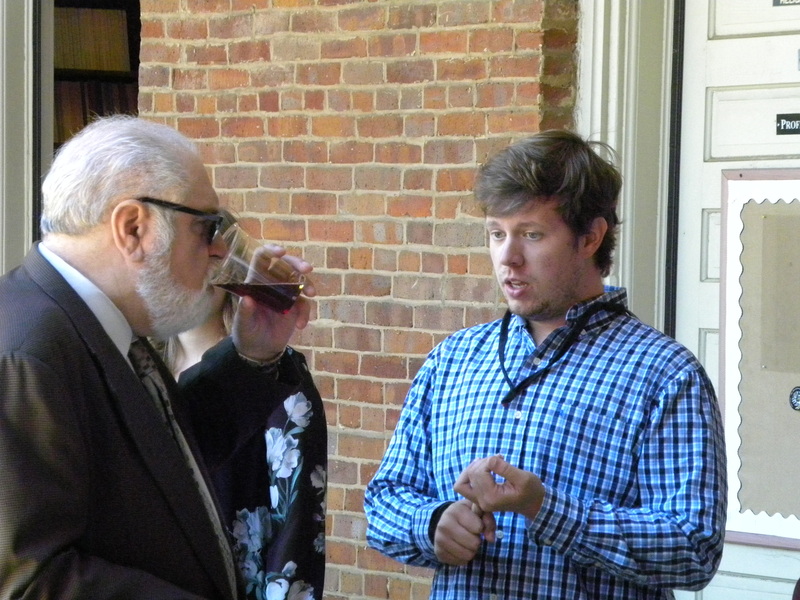 Another recent graduate, Reid Turner, was in town for the weekend so he stopped by, apparently to discuss some highly important topics with Professor Jacobs. 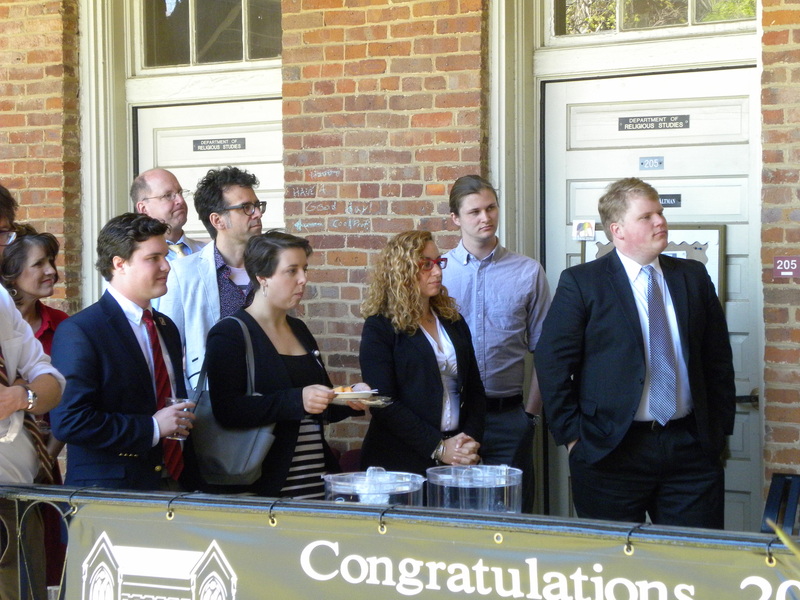 On the Manly Hall balcony, professors, students, and families gather as we get ready to honor this year’s Silverstein Scholars and our Outstanding Students. 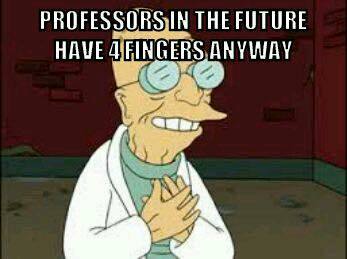 There’s Profs. Bagger, Loewen, and Touna. Kyle Ashley (below), another one of our many Silverstein Scholars, opens a gift from the Department that each student received: a personalized book plate stamp, complete with the Department motto and all; they are official! 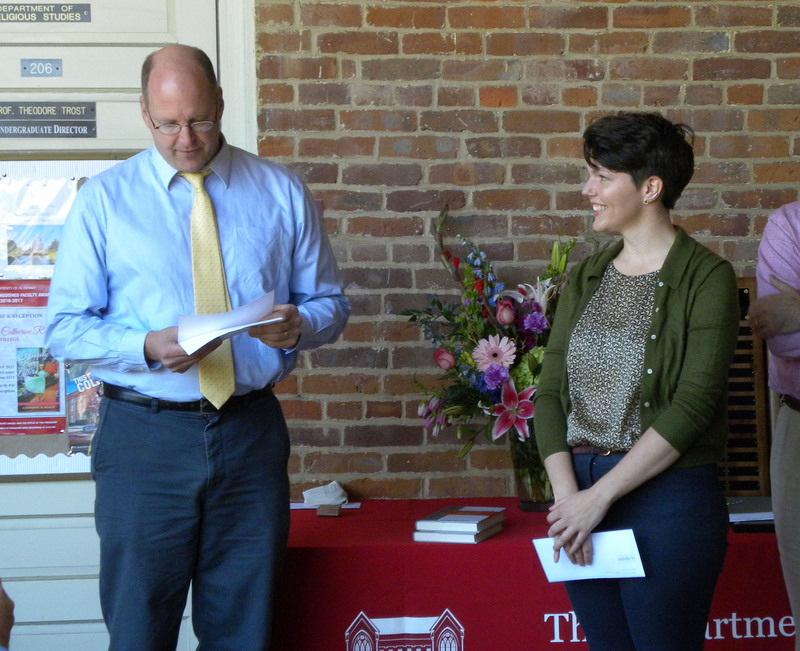 Below, Allison Preslar and Matthew McCullough step up to receive their Silverstein awards from Prof. Jacobs. 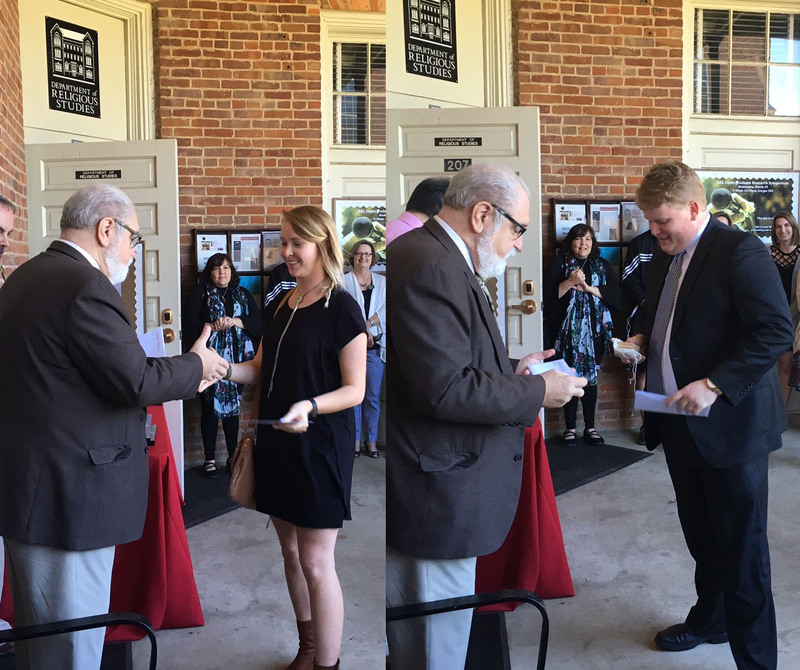 Anastasiya Titarenko and Keeley McMurray are congratulated as well by Professor Jacobs (and Professor McCutcheon readies the book stamps). Next up to get their awards is Caity Walker, who is in a long line of students working in our main office, and Ashley Eggert. 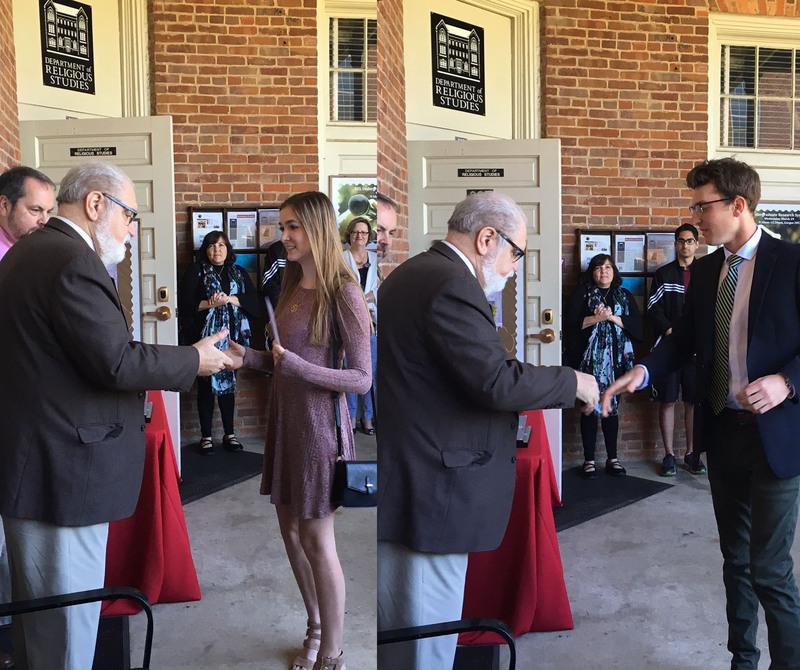 Caitie Stewart (who, yes, also was a main office worker at one point) and Parker Evans (well, at least his back) are congratulated by Prof. Jacobs as well. 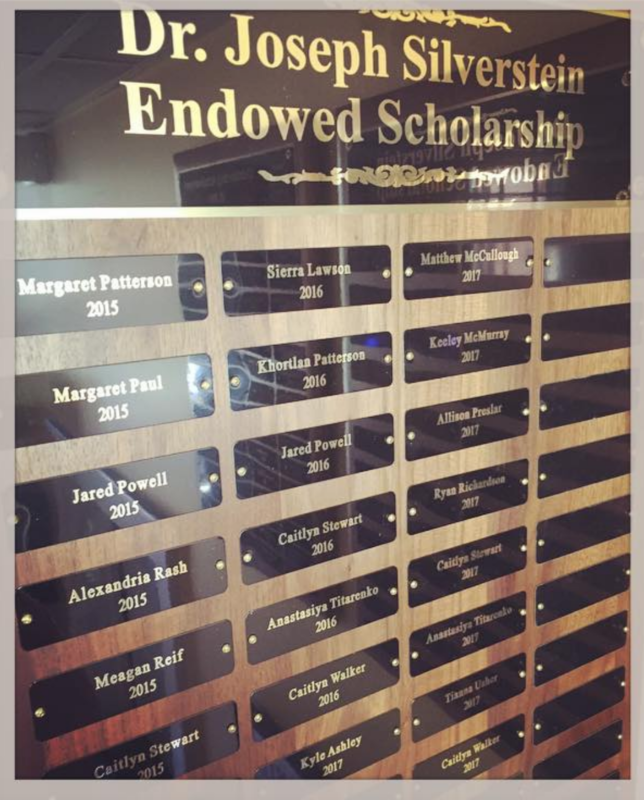 Luckily, we also caught a profile of Parker earlier that day, when he was among the students recognized by the Department of English, his other major. Ryan Richardson (below left, who helped us invent our new peer mentors program this semester) and Wayne Ingram also come up to accept their awards. There she is: Ellie Cochran (below, center) GoPro‘d the event so she and Caity Walker could have some footage for an upcoming Honors Day video. And there’s REL major Alex Tamez (center, background) and Prof. Ikeuchi too. 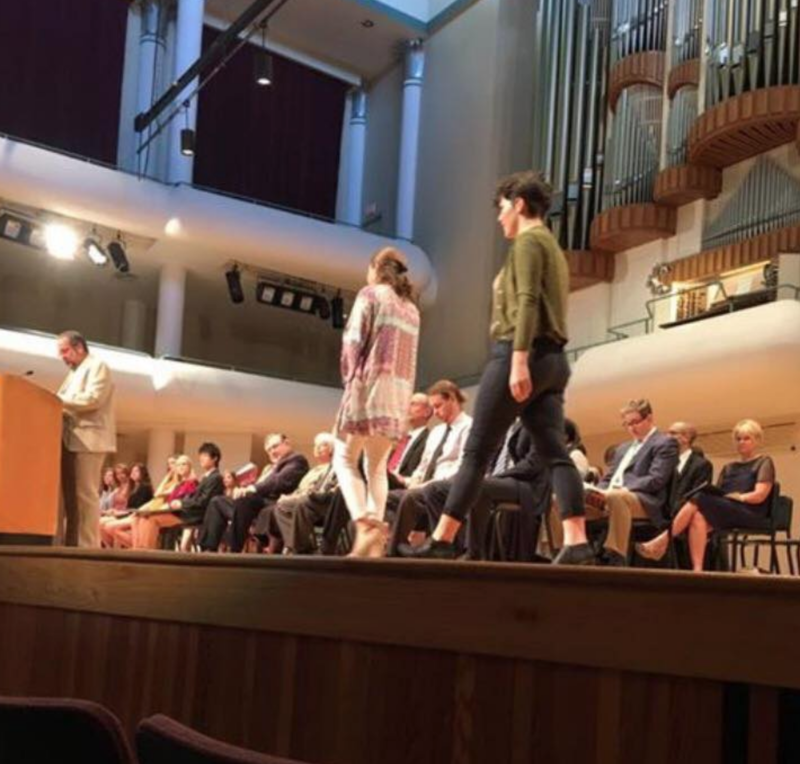 Earlier that day Sierra and Madeleine Lewis (below, who is also a graduating senior, with a dual degree in REL and Math) had been called on stage, at the College of Arts & Sciences’ Honors Day Convocation and presented by Prof. McCutcheon with awards as our two Outstanding Students. 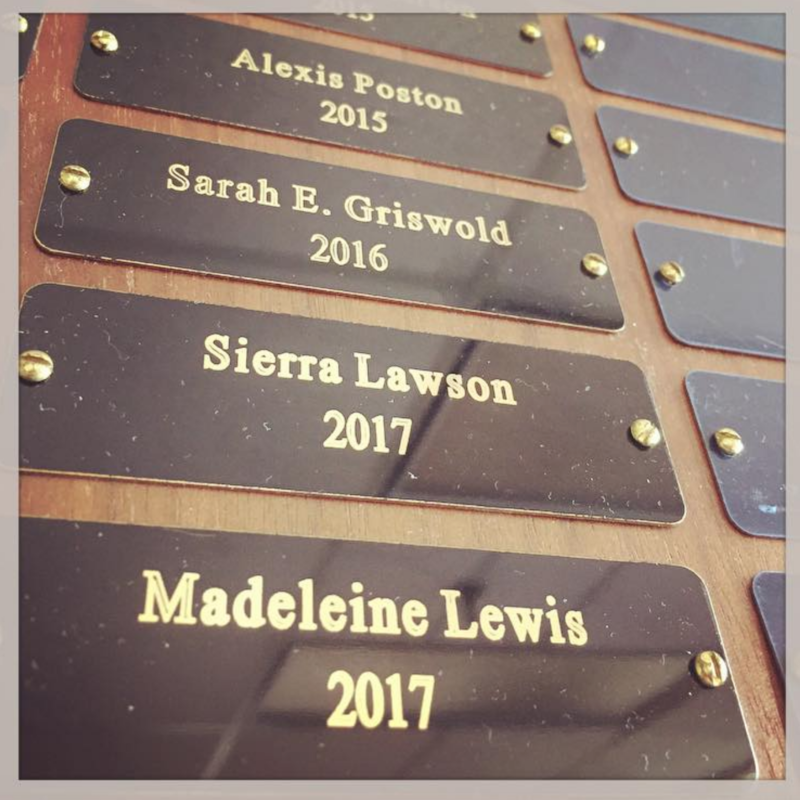 And, yes, their names, as well as the names of this year’s Silverstein recipients, are immortalized on plaques in the Department lounge. 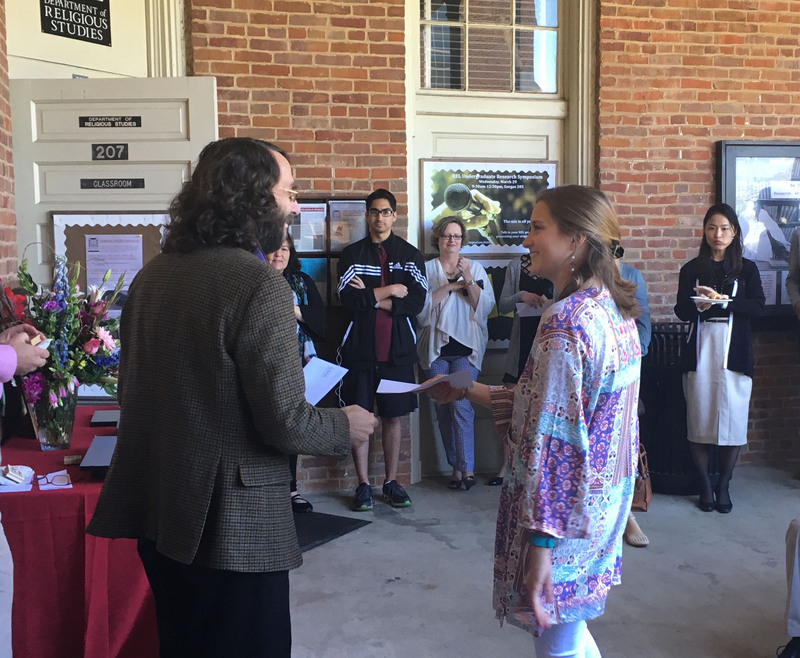 Below, Prof. Bagger presents Madeleine with a copy of Prof. Ramey’s edited book, Writing Religion (signed by all of the REL faculty), which collects the first decade of our annual Aronov lectures. 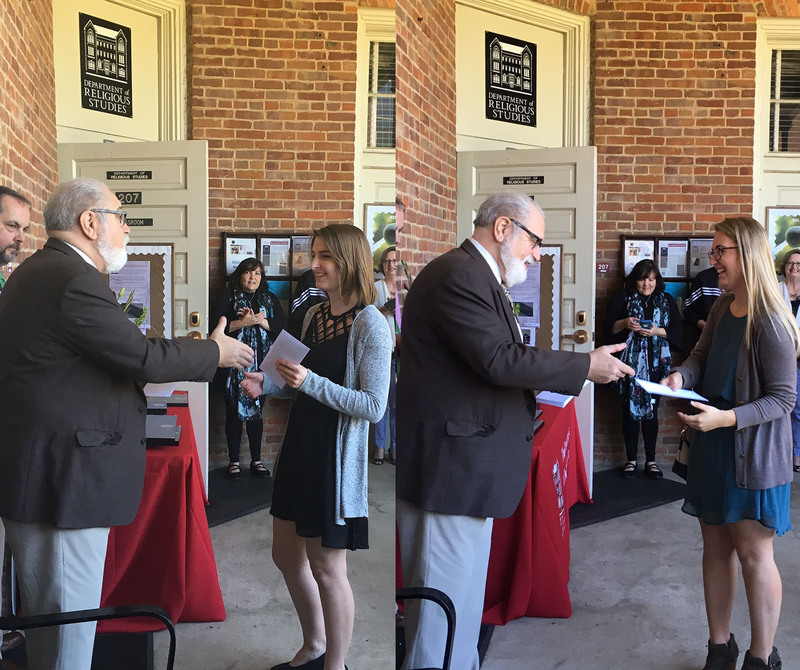 Both Sierra and Madeleine placed in the campus-wide undergraduate research competition this year, so that deserved recognition as well. 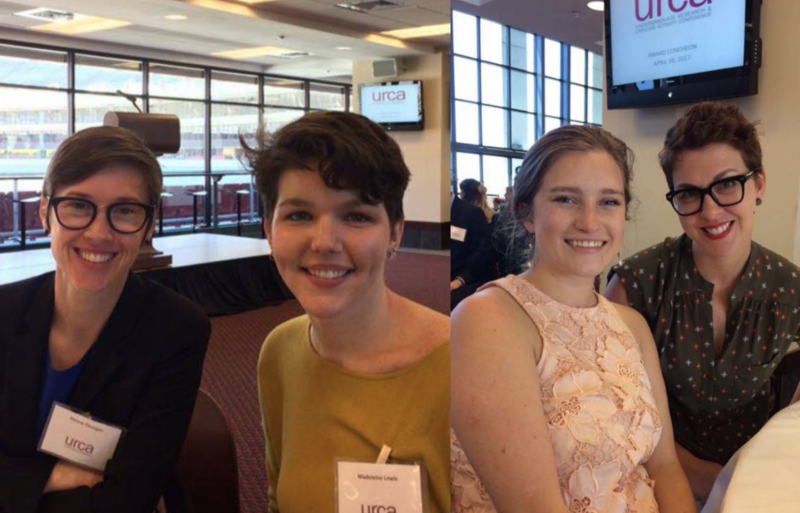 Prof. Finnegan (below, far left) worked with Madeleine on her paper, which won a third place in the Social Science division, and Prof. Simmons (far right) worked with Sierra on the paper she presented (which placed second in the Social Science division). Below they’re all pictured attending the awards luncheon. 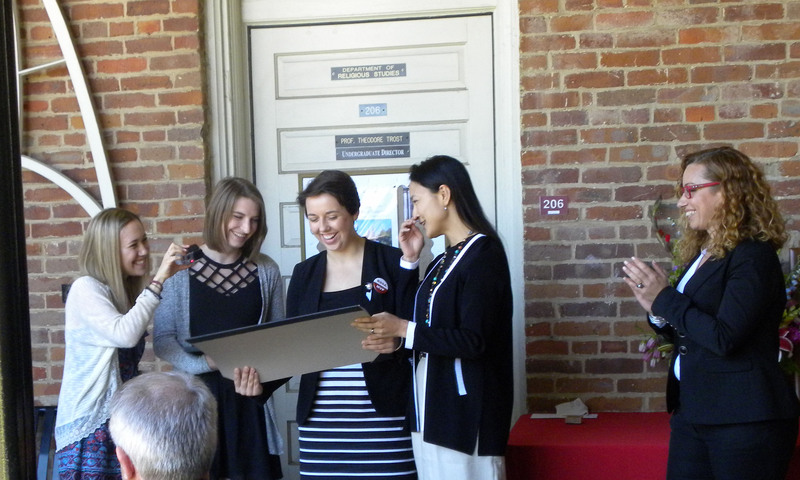 Professor Touna (below, far right) was up next at our Honors Day ceremony, handing the torch off to Prof. Ikeuchi (below, middle), who will be the Religious Studies Student Association Adviser for the upcoming year (with Prof. Touna moving on to plan REL events). 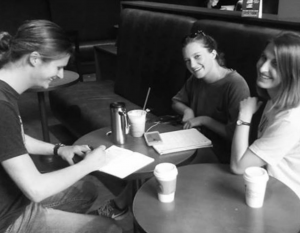 Prof. Touna generously gifted a calendar to Prof. Ikeuchi as well as the new RSSA executives (from left to right: Ellie Cochran, Caity Walker, Anastasiya Titarenko) so that they may plan the year’s events. 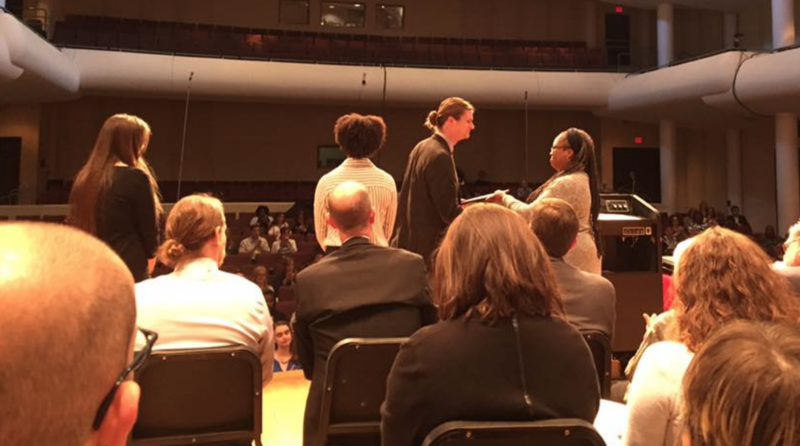 With the student awards all handed out, we didn’t stop there, since some of our faculty members were also honored this year. 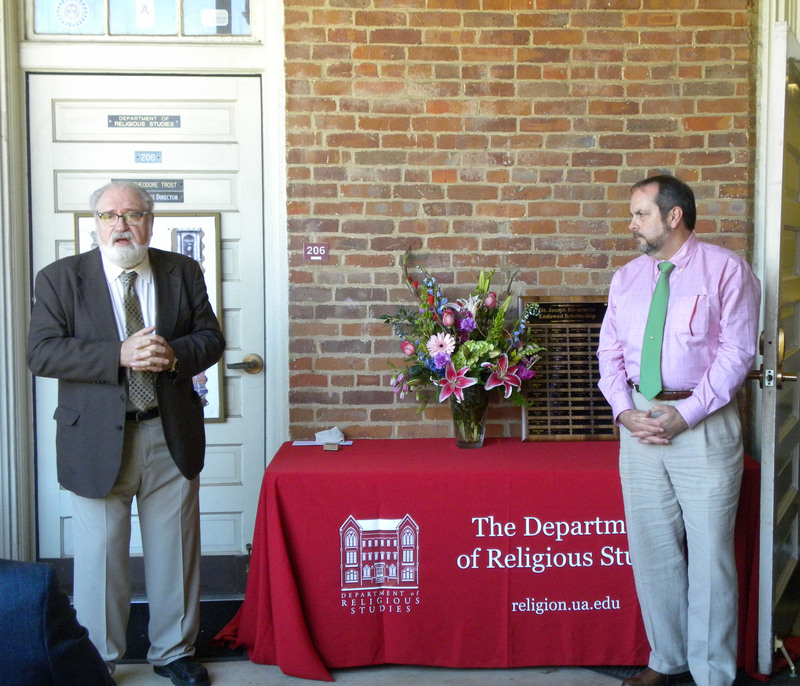 For example, Prof. Loewen (pictured on the left, below) presented Prof. Ramey (who is also the Director of the Asian Studies minor) with a gift to mark his10 years with our Department. 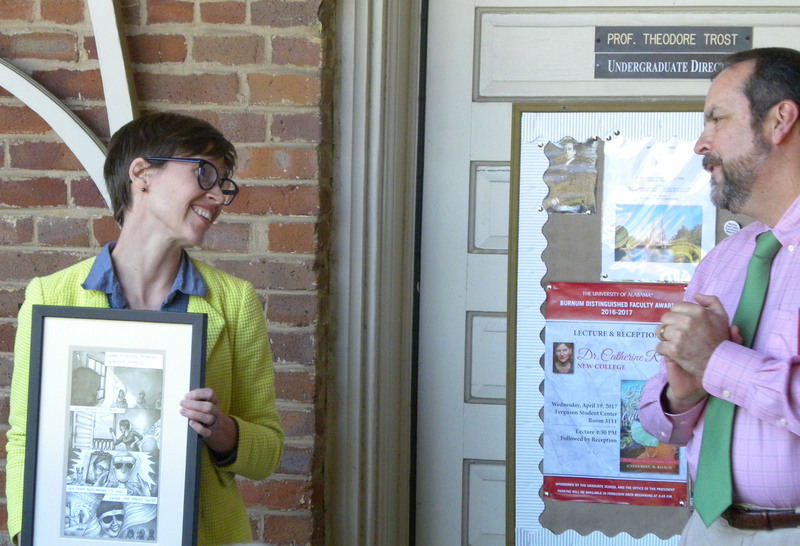 Professor Eleanor Finnegan (below, left) received a farewell gift of her very own cartoon, as she completes her last semester here at the University of Alabama before she moves on to Boston, MA. Eleanor, who earned her Ph.D. at the University of Florida, was with the Department for four years, had an appointment also to History, and, among other topics, taught courses on the study of Islam. 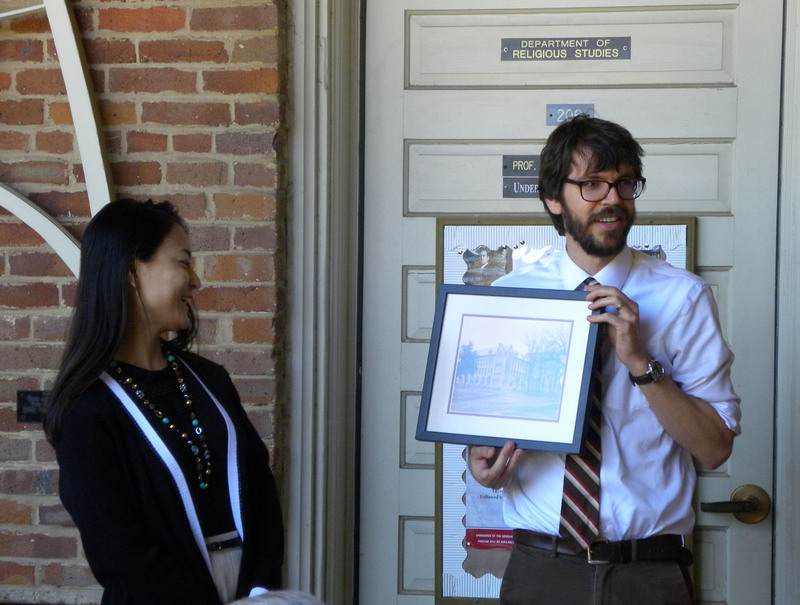 Professor Ikeuchi (below, left) also accepted a surprise award, from Dr. Altman, as congratulations for the completion of her first year as an Assistant Professor in the Department of Religious Studies. 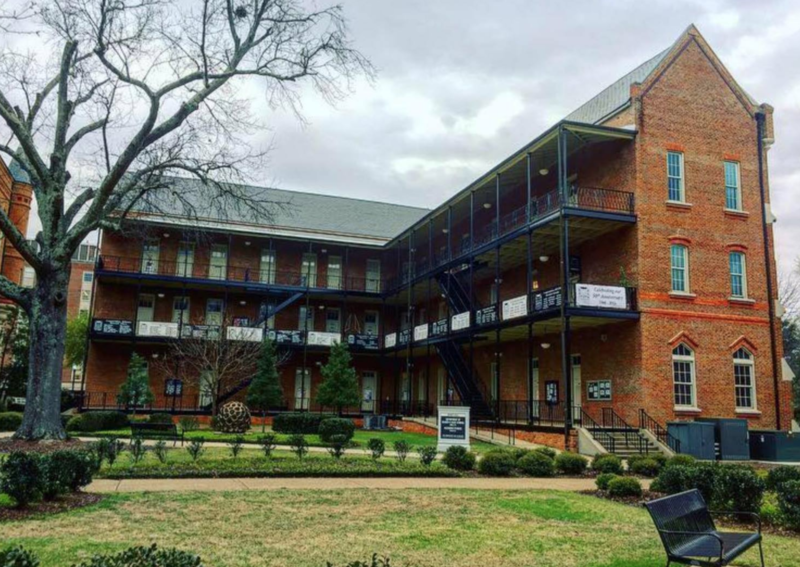 All new faculty, over the years, have each received an historic photo of our home — or, as Prof. Altman phrased it: the prettiest building on campus, where we get to work. Prof. Jacobs was given a gift too, by Prof. Finnegan, as a congratulations to mark his serving 15 years with our department — he came in January 2001, making him our second longest serving faculty member (behind Prof. Trost [who was at a conference that day], who arrived in 1998). 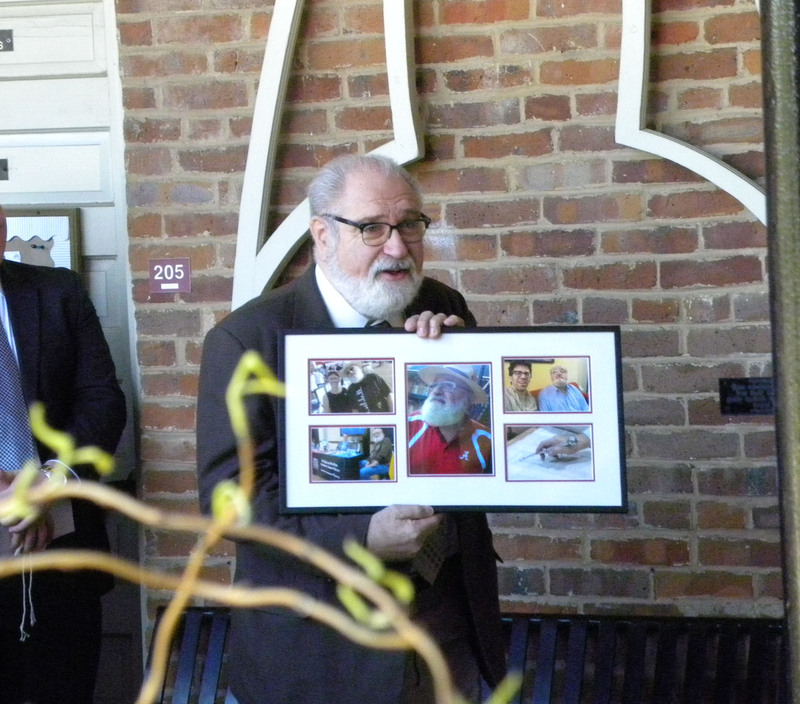 Like Prof. Ramey’s presentation, it was a framed montage of photos of them from over the years. 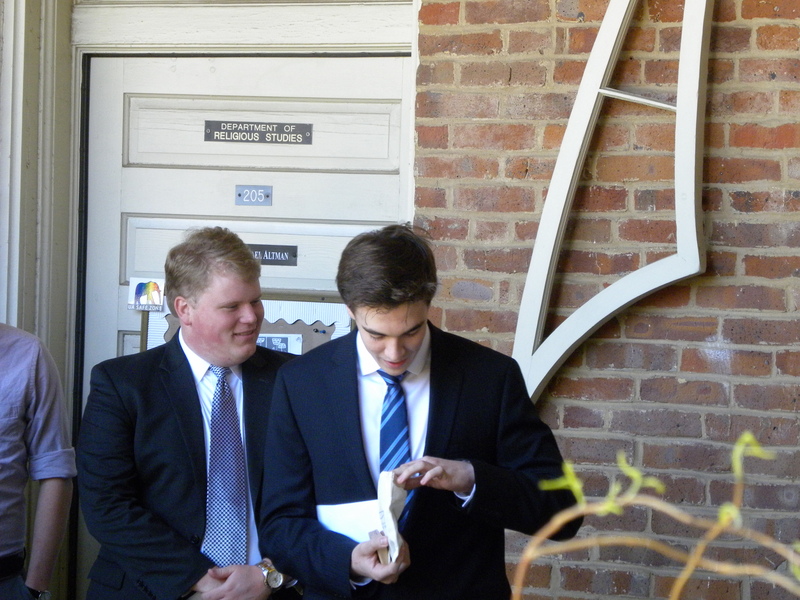 And there was even a surprise for Dr. Altman…. Well, let’s just say that his right hand had a rough time this year and so we thought that we should mark him overcoming that by presenting him with an action figure that embodies the faculty-member-of-the-future. 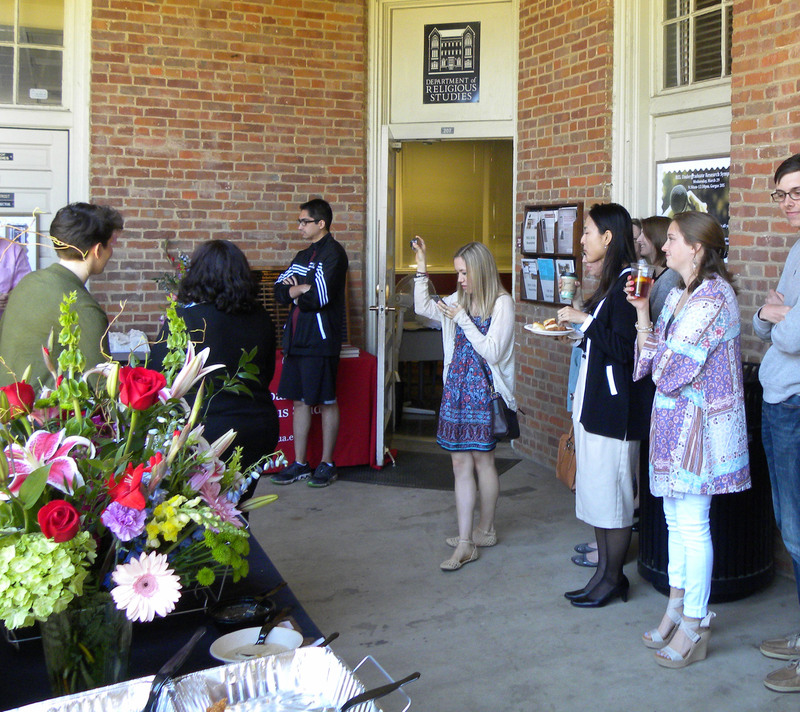 Our thanks to everyone who came to Manly Hall to help us celebrate — it was another great year and we’re pretty proud of all of our students. And we’re especially honored to be able to mark the accomplishments of some of them. 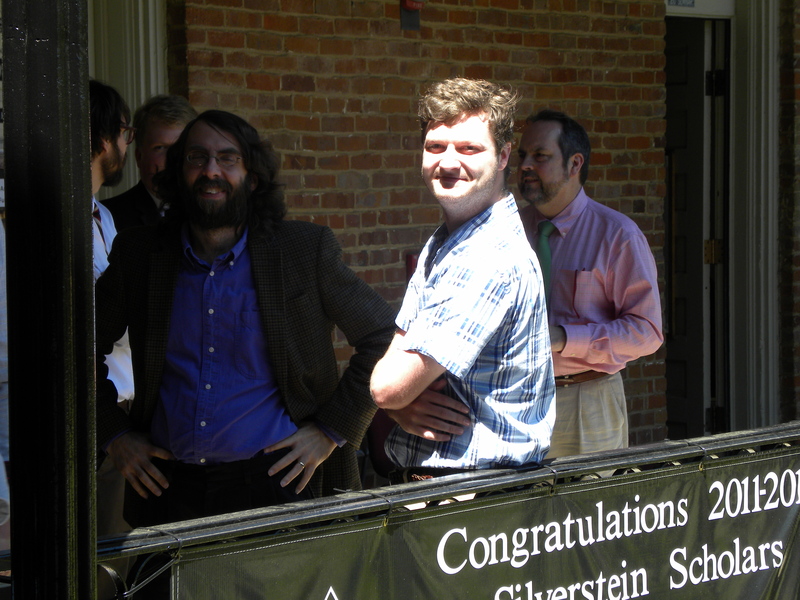 So look for the Honors Day video in the near future and, if you’re on campus, you’ll probably soon seen our annual Silverstein banners coming down — did you notice that they almost took up the whole balcony this year? With no #REL50th banner hanging among them next year we’ll have room for just one more. Well, we have some faculty on the third floor so maybe it’s onward and upward the year after that. 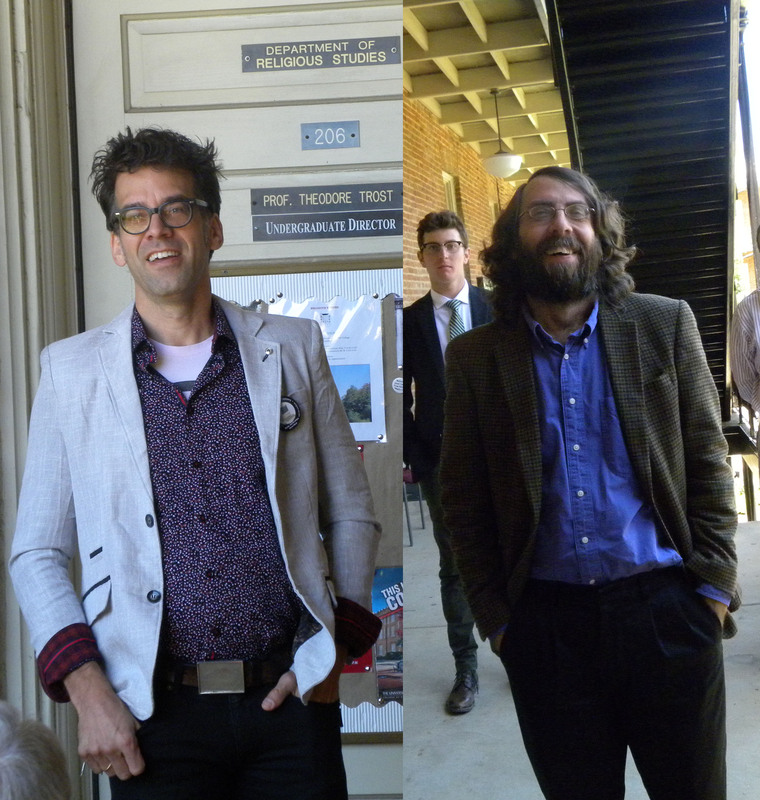 A big thank you to everyone who helped to make the day a success — especially Betty Dickey and Prof. Touna, who took our pictures. 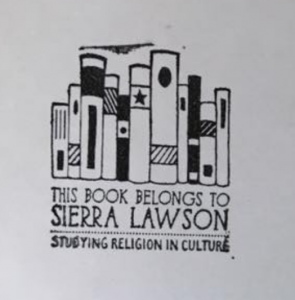 This entry was posted in Faculty Blog, Public Events, Relevance of Humanities, Religion in Culture and tagged #REL50th, 50th, Honors Day, Outstanding Students, Silverstein Scholars by admin. Bookmark the permalink.